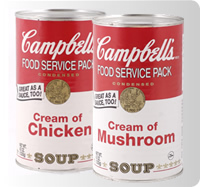 Campbell's Food Service provides food service professionals with a wide spectrum of products that save time, enhance your menu offering and build profits for your business. Operators from different segments including restaurants, cafes, bakeries, caterers and airlines have been using our products to provide the great taste their consumers desire. With our easy-to-prepare products, you and your customers can be assured of the taste and quality you've come to expect not only at home…but away from home, too!